Formulated by respected naturopath Xandria Williams ND, this synergistic blend of nutrients and herbs has been designed to support the health of the adrenal glands. 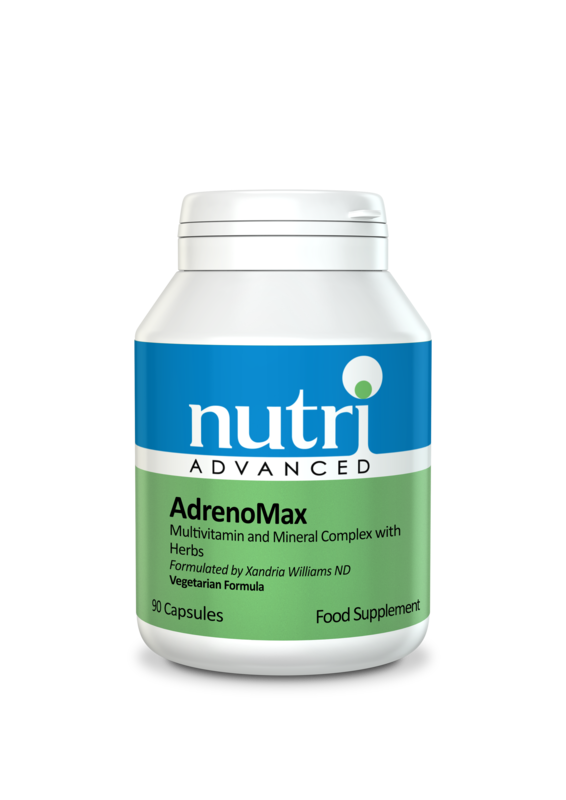 AdrenoMax can also be used as a multi-vitamin mineral supplement for those needing long term nutritional support for the adrenals. The adrenal glands produce numerous hormones involved in blood sugar balancing and stress adaptation, including DHEA, cortisol, adrenalin, and noradrenalin. Optimal adrenal function is critical for stress adaptation. Vitamin C and pantothenic acid are found in very high concentrations in adrenal tissues and support optimal adrenal health. B vitamins, especially vitamin B6, and magnesium are critical for optimal blood sugar balance. Chamomile, lime blossom, hops and passion flower have a long history of use for their soothing properties. 5-HTP is the essential nutritional precursor for the neurotransmitter serotonin. This product contains vitamin A. Do not exceed 750μg of vitamin A (as retinol) per day if pregnant or likely to become pregnant, except on the advice of a doctor or antenatal clinic. \Not recommended for individuals with Wilson’s disease (copper).